HMS Mersey helped to rescue a mariner who was overboard in stormy conditions. BRITAIN’S response to a surge of illegal migrants attempting to sail into the country from the English Channel has been branded an ‘utter shambles’ by a former Royal Navy boss. Admiral Lord Alan West slammed the response by the Home Office, which was forced to deploy patrol ship HMS Mersey to the Channel to respond to the crisis last month. HMS Mersey on patrol in the English channel near Dover in Kent. The move was taken as an ‘interim measure’ because Britain’s UK Border Force was short of vessels to patrol the Channel, while it waits for cutters based overseas to sail home. So far the deployment of the Portsmouth-based warship has cost the UK taxpayer £700,000 – money the Home Office has vowed will come from its budget and not that of the Ministry of Defence, which is facing its own cash problems. However, in a scathing critique of the action by green-lit by home secretary Sajid Javid, Admiral Lord West said: ‘This operation has been a complete and utter shambles. ‘That is a real worry because, as we move towards Brexit, the need to patrol our territorial seas and enforce our laws both there and in our exclusive economic zone is going to become greater. Who on earth is co-ordinating this? ‘In the navy we have a nice tradition where occasionally we shoot a senior officer to encourage the others. This might be a perfect candidate for the case. ‘We have in place a joint maritime operations centre, which has all the departments there. ‘Why can we not fully fund it and put a person in charge – a naval officer or whoever, I do not care – who can co-ordinate our shortage of assets to do the things we need to do? Tory peer Baroness Williams said plans were in the pipeline to tighten procedures. She said: ‘The noble lord is absolutely right to point out that as we approach Brexit we should be mindful of some of the events that might happen around it. ‘We will shortly have a director in post at [the Joint Maritime Operations Coordination Centre], which I hope gives him some comfort. Confirming the funding arrangement for HMS Mersey, Baroness Williams said to date the move had cost £700,000 and added the deployment would be ‘funded by the Home Office and will be kept under constant review’. News of HMS Mersey’s deployment to the coast off Dover was announced by defence secretary Gavin Williamson on January 4 after a plea from the home secretary. 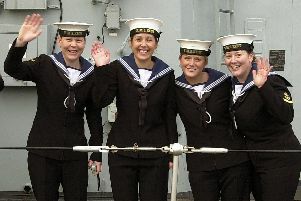 She joined other UK Border Force vessels that were on patrol in the area. It represented an escalation of Britain’s action to counter migrants crossing into the UK. Previously, Mr Javid had been criticised for referring to the crossings as a ‘major incident’ and for questioning whether those trying to get over were genuine asylum seekers. He said 539 people had attempted to cross the strait in 2018, with 80 per cent of those making the journey in the last three months of the year.